I had the pleasure of attending a two day training over the summer with the Gateway Writing Project about teaching argument writing and how we can use it to support the need for evidence-based writing in the Common Core ELA and math standards. 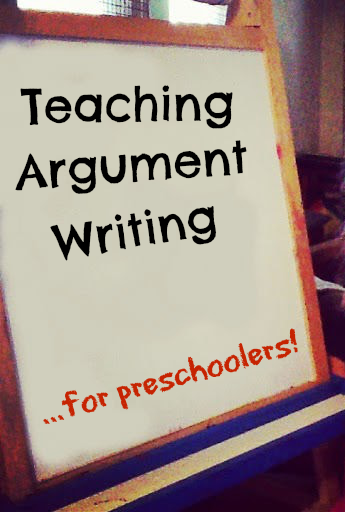 CCSS.ELA-Literacy.W.9-10.1 Write arguments to support claims in an analysis of substantive topics or texts, using valid reasoning and relevant and sufficient evidence. CCSS.ELA-Literacy.W.6.1 Write arguments to support claims with clear reasons and relevant evidence. 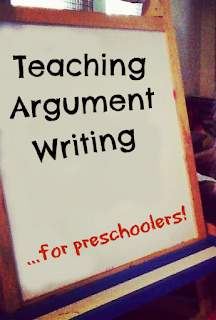 Although the requirements for thinking abstractly and putting together objective, argument pieces are not introduced until grade 6, the foundation of vocabulary, thinking and process of gathering evidence, making claims, and evaluating warrants could ideally begin in earlier grades as students write explanatory pieces. 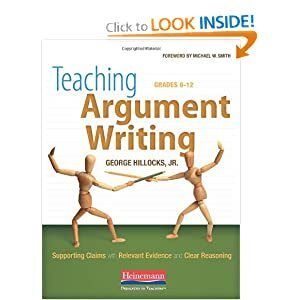 Before I get ahead of myself, let me quickly define for you a warrant and a claim as from this book by George Hillocks, Jr., Teaching Argument Writing, Grades 6-12. But What Does That Have To Do With Teaching Preschoolers? Of course, I wasn't sitting down with my daughter this evening and discussing vocabulary with her - we weren't even writing anything. Our exposure to argument and reasoning was during story time before bed. We read Pinkalicious: The Princess of Pink Slumber Party, which recently came from the library. The plot of this story doesn't really matter. You just need to know that Pinkalicious has a slumber party, and one of the friends ends up having a fear of falling asleep at another house. Pinkalicious gets the girl to imagine various sounds and smells around the house are from a happy guardian dragon. "Do you think this is a mean dragon, or a nice dragon?" "Ah, and so usually when people are nice, they smile." We continue on the story, and I'm happy to report, the little girl has no problem falling asleep. Lucy did not produce an entire argument on her own, of course, but would you even expect that of all your middle schoolers or 9th graders? With some scaffolding questions, she was able to show the bones of some basic reasoning, however. Claim: In response to my leading question, Lucy's claim is that This is a nice dragon. Evidence: When I asked Lucy how she knew, she easily pointed out that the dragon was smiling. In the experience of my own classroom with something like classifying functions, the process has been the same. I might ask, "Is this a quadratic function," to which a student at first may only respond, "Yes," but after I ask, "How do you know," she will often be able to point out a defining characteristic from a table, graph, or equation. Warrant: As defined by Hillocks, a warrant is often something generally known. Kids learn quickly that they can usually trust adults or other kids that are smiling. Lucy left this off of her "argument," but warrants are the bones that support claims. While warrants in an English or Social Studies class may be a little more subjective, I think STEM subjects generally have a stronger leg to stand on when picking out and using warrants. I explained warrants to a colleague today in the math office as being the properties and laws our students (often) write down and (rarely ever) use in their problem solving. The first several times you attempt argument writing with your students, I think it may end up looking and feeling a lot like my conversation with Lucy. I think that has to be okay. Use guiding questions in pre-reading. Support them with definitions and clarify/refine their usage of warrant/ claim/ counterclaim. Restate their conclusion so they can have a chance to analyze if it "sounds" right once they've heard it outside of their own head or from their paper.